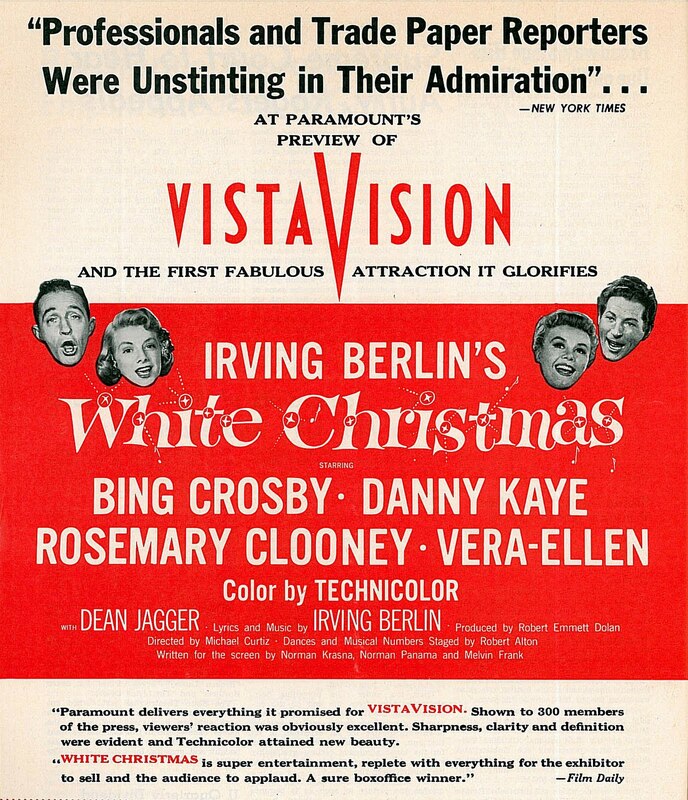 Paramount was wise to launch Vistavision on a surefire vessel, White Christmas being hit-bound from point of inception, thanks to Crosby and Irving Berlin participation, their names having defined yuletide seasoning since 1942 and the song's debut in Holiday Inn. It had been decided not to bang drums so loudly for Vistavision as Fox had for Cinemascope, for this wasn't a format to bowl them over outside of primo houses with jumbo screens. Press previews were had from late August to encourage early White Christmas shopping, and to advance Paramount's contention that 1.85 was ideal ratio for projecting not just Vistavision, but all movies. Critics like The New York Times' Thomas Pryor seemed persuaded, and for not a first time, VV was discussed as maybe successor to, and possible superior of, Cinemascope. 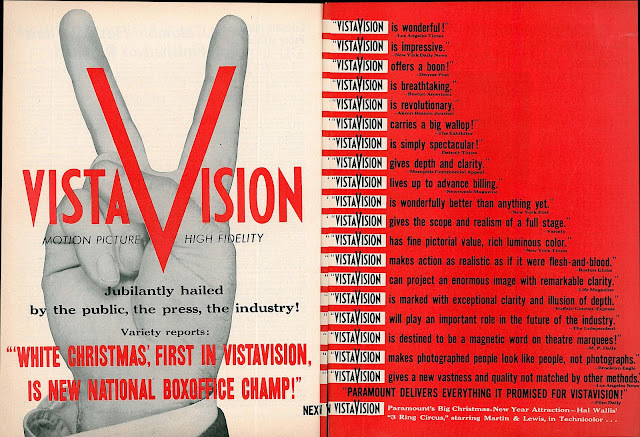 Miami Beach and Jacksonville screenings in early October came following Florida search for venues suited to Vistavision (The physical setup of theatres will be a major consideration in Paramount's licensing of exhibitor's contracts, said Daily Variety). 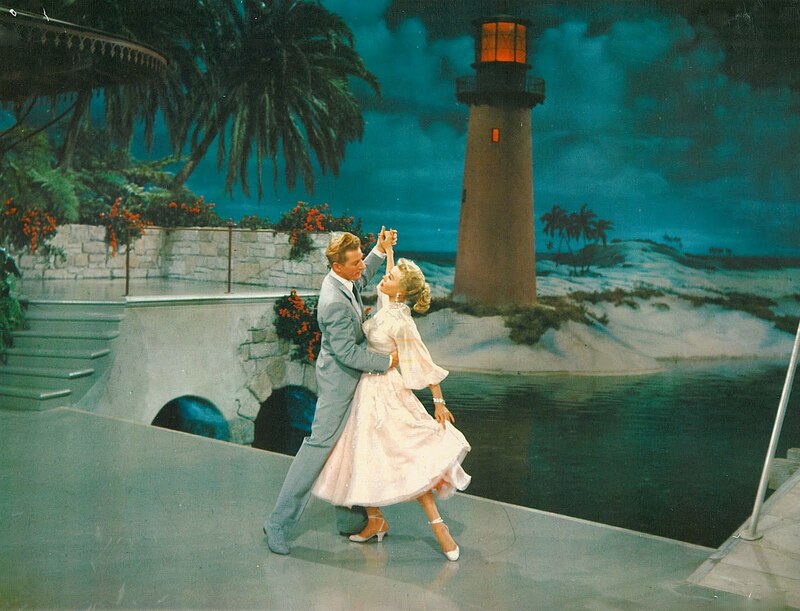 Opening days at these would closely follow New York's Radio City premiere. 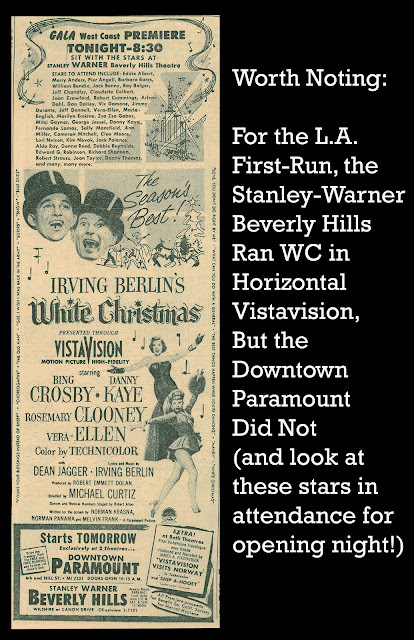 Paramount recognized importance of a fully-engaged press, and so arranged a September 9 midnight trade sneak at the Music Hall, sans formal invites, though word got out via phone calling and tip-offs among columnists. What were we giving away?, said Para chief Barney Balaban when he saw the crowd of 3,000, It's like bank night! 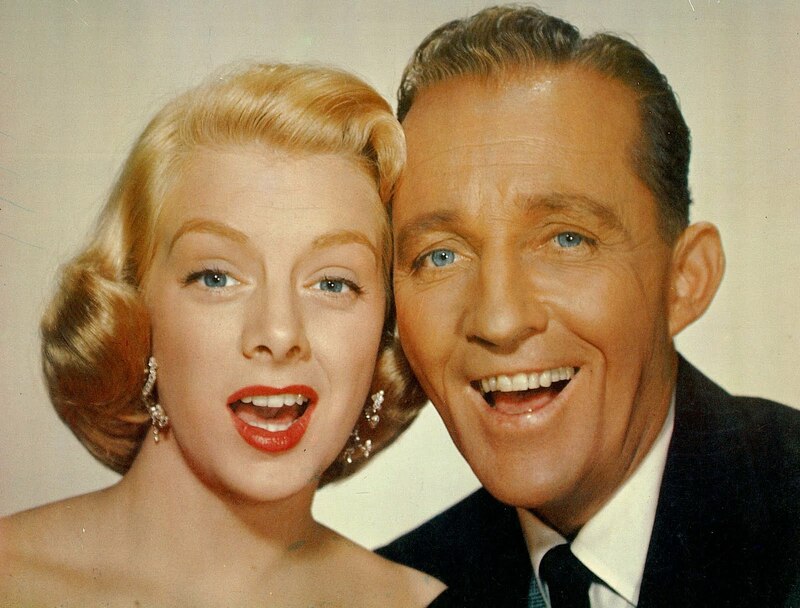 (Danny Kaye and Irving Berlin were also in attendance to stir excitement and get their percentages rolling). 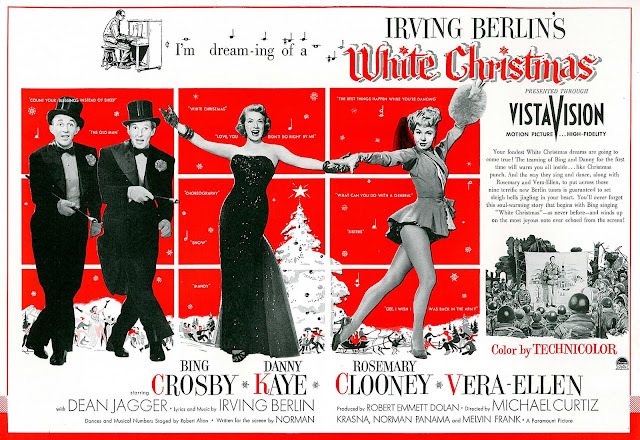 White Christmas opened to the public at Radio City on October 14, 1954 (running head-to-head in two NYC theatres was A Star Is Born). Technicians were busy round-the-clock for a week prior installing horizontally-fed projectors to address a sixty foot wide, nearly thirty foot high, screen. 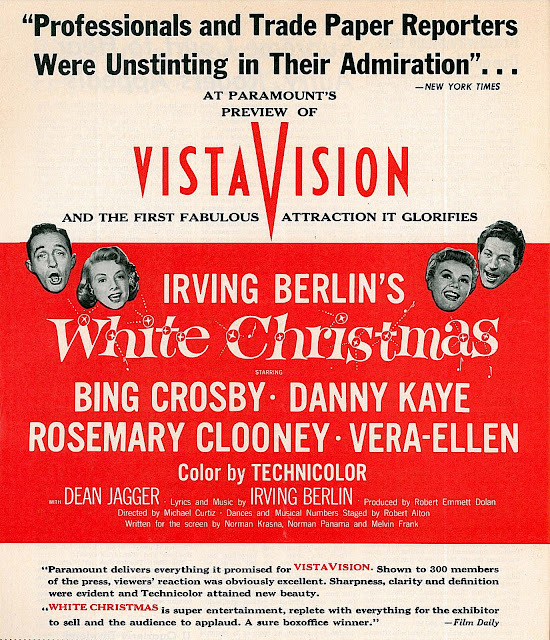 The Music Hall actually used a 1.97 ratio for White Christmas as opposed to Paramount's recommended 1.85, so large was their screen as opposed to others that would be exhibiting the film (Balaban maintained that Vistavision could indeed be tailored to fit virtually any screen size not exceeding 2.1). Motion Picture Exhibitor got an insider's view of what went on in Radio City's booth during opening stanza of White Christmas. 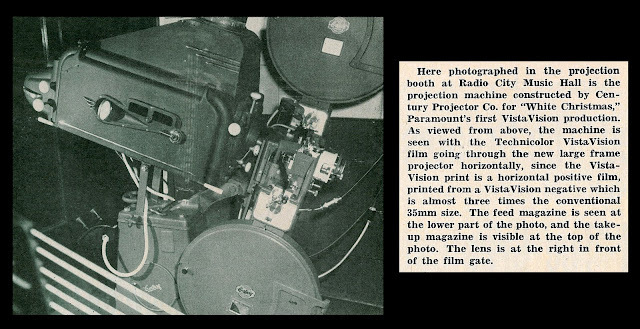 Projectionists may not be too happy working with these machines, said the so-called "impartial observer." He found that the noise of the film going through the machine at twice the normal speed (this due to larger frame size on horizontal prints) resembled a machine gun in action. Threading was complicated as well, and oversized 5,000 ft. reels had to be used. Rewind time was increased considerably, especially as careful inspection is in order and the result has been that a number of prints have had to be assigned the house to make sure that a print is always available for each showing. Rewinding and attendant chores took so long as to necessitate overtime paid to men in the booth. Noise from the projectors was so great as to require burlap placed over portholes to keep racket from spilling into the theatre. Initial horizontal prints of White Christmas did not have soundtracks, so a regulation machine was synchronized alongside to play the movie's sound. 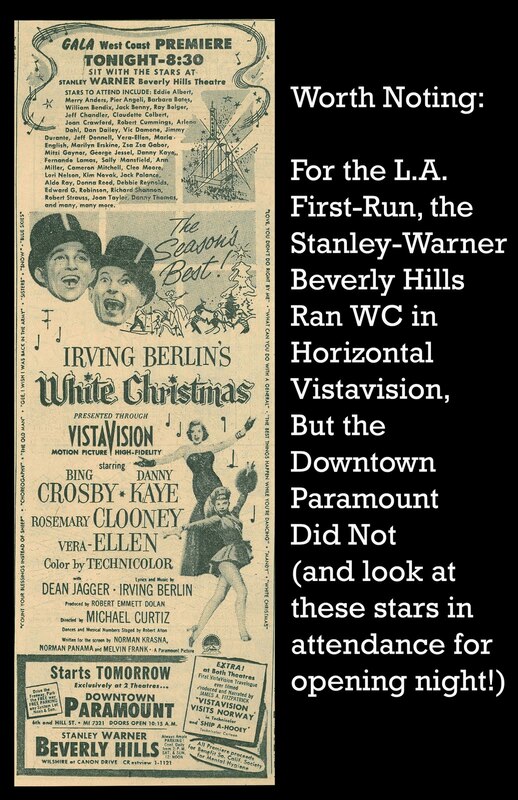 Vistavision was still, for Adolph Zukor at least, an "emotionally affecting experience." He felt these results gave the public more than it expected for its money. Paramount was quick to assure exhibitors that horizontal projection would not be required to get maximum values from Vistavision. Its most practical application would be to theatres with a screen fifty or more feet wide. As of October 1954, there were only twenty-eight venues with screens over sixty feet in width, and those measuring between fifty and sixty numbered less than one hundred (this according to Variety). There was no reason to use horizontal projection in such locations, said Paramount. Drive-Ins would be another matter, however. Many outdoor screens boasted screen width of 120 feet and up. Horizontal Vistavision's brighter light and sharper image would translate well to these leviathans, and what's more, ozoners could begin their shows thirty minutes earlier thanks to greater illumination on outdoor screens. 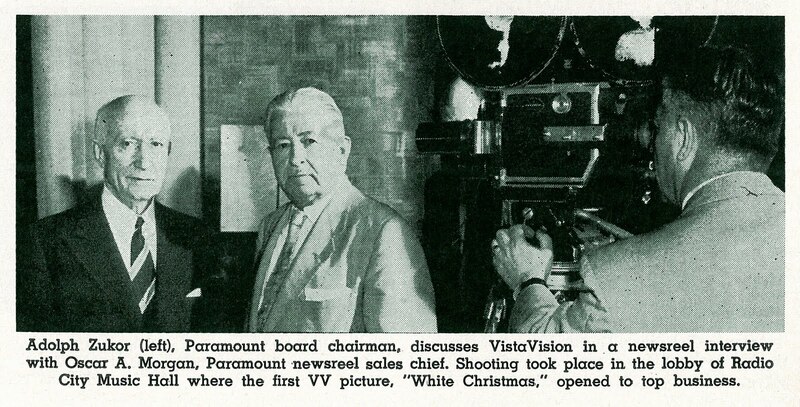 Optimistic Paramount looked to a day when exchanges would be stocked with standard and horizontal prints of all VV features, and beyond that, possibility of Vistavision becoming standard format for roadshowing specials. Trade reviewers were glowing, especially as these stood likeliest to realize profit. Good Cheer for Exhibitors, said Boxoffice, those showmen who have the good fortune and good judgment to book the current offering can confidently expect Santa Claus to slide down the chimneys of their respective theatres and to deposit on their desks a brimming bagful of kopeks and kudos. This White Christmas would also be a green one, they promised. Mainstream critics were tolerant, if not so enthusiastic. 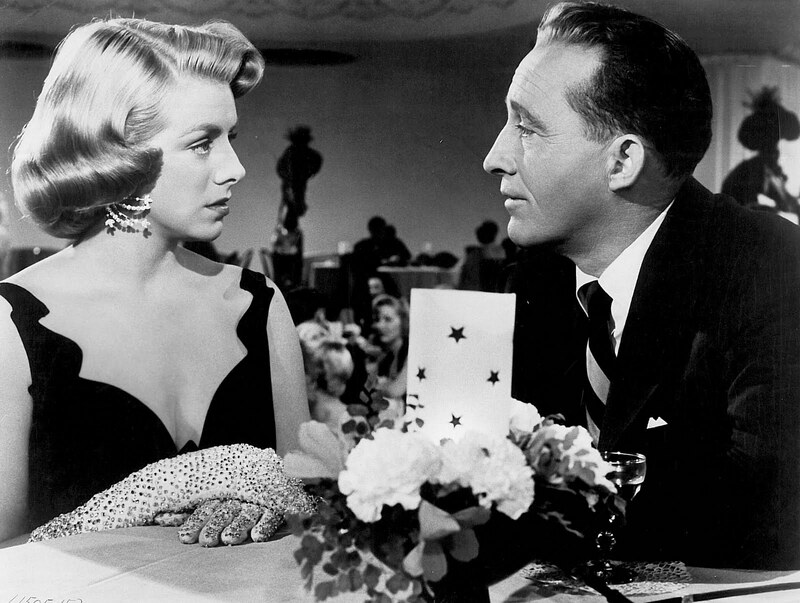 Bosley Crowther found the confection is not so tasty as one might suppose, and that White Christmas lacked overall the old inspiration and spark of its progenitor, Holiday Inn. But for what did such carping matter? Paramount knew they had a hit beyond criticism's reach, and set terms accordingly. Percentage for key city bookings would be at 70/30, with the distributor taking a lion's share (there was a guarantee that at least ten percent of a theatre's take would represent profit). Sixteen (mostly) extended runs initiated Paramount's pre-release of White Christmas through latter October, November, and into December, that number expanding as holiday season approached. The West Coast opening was in two Los Angeles theatres. 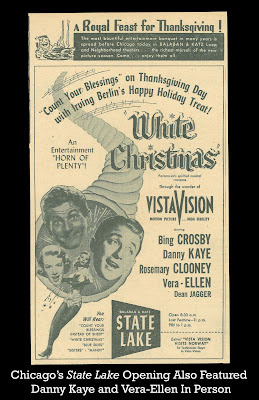 One of these, the Stanley-Warner Beverly Hills, was the second venue to present White Christmas in horizontal Vistavision. Television station KTLA covered stars and guests entering the Stanley-Warner, a portion of which was picked up by NBC for wider network broadcast. TV was coming into its own as a valuable marketing tool, whatever the competition it represented to Hollywood otherwise. Stay tuned. 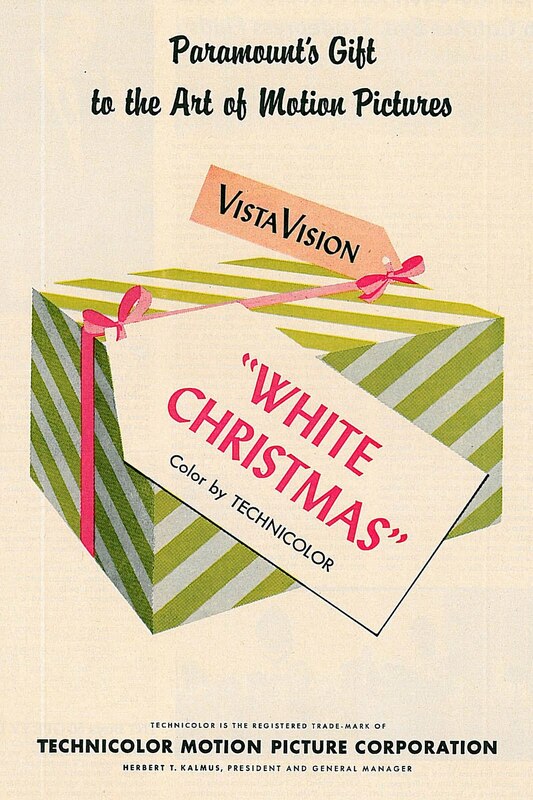 Vistavision and White Christmas goes into a third inning this week by or before Christmas Day (just too much info and images to get into two parts). The trade quotes you have are always a treat, a real window to the past. "Kopeks and kudos" would make a great book title. It's almost like they're speaking another language. 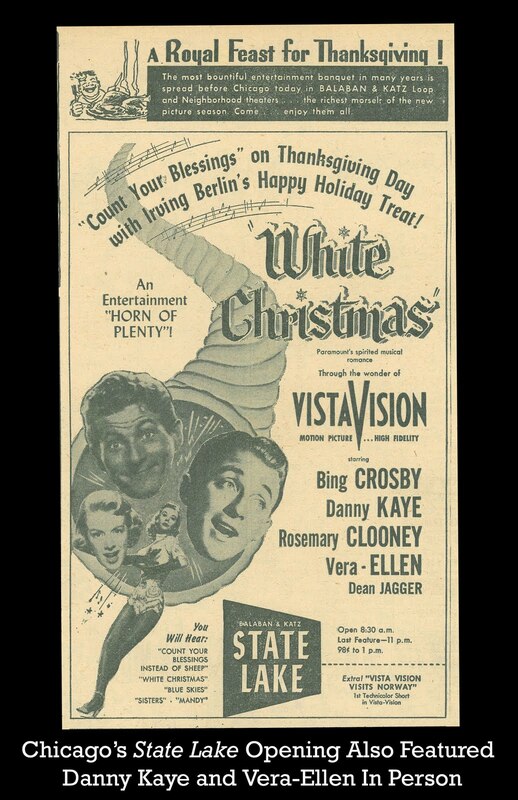 Your info on projecting Vista Vision is a lot more fascinating than "White Christmas," I know directors have to bring home a paycheck but I wonder what Michael Curtiz was thinking when he filmed this slop. Incredibly-researched article. Looking forward to the wrap-up.